Mohawk hairstyles for natural hair can deliver a bunch of original hairstyling solutions as well as good protection by way of popular protective hairstyles for African American women. To be honest, the following are fauxhawks… I mean I don’t encourage everyone to shave the sides. This can look pretty cool at some individuals, but that’s not very practical, while with fauxhawks you can change your hairstyles as often as you wish. Well, let’s see some pictures. A natural hair Mohawk is not only fun to wear, it’s fun to admire, too! This style allows your curls to go wild while still maintaining style and control. When it comes to natural hair, a Mohawk is really a fun alternative to the typical afro trend. For this specific hawk, hair was not only shorn upward, but dyed a stunning red-orange hue that brings a whole different game to the hair. 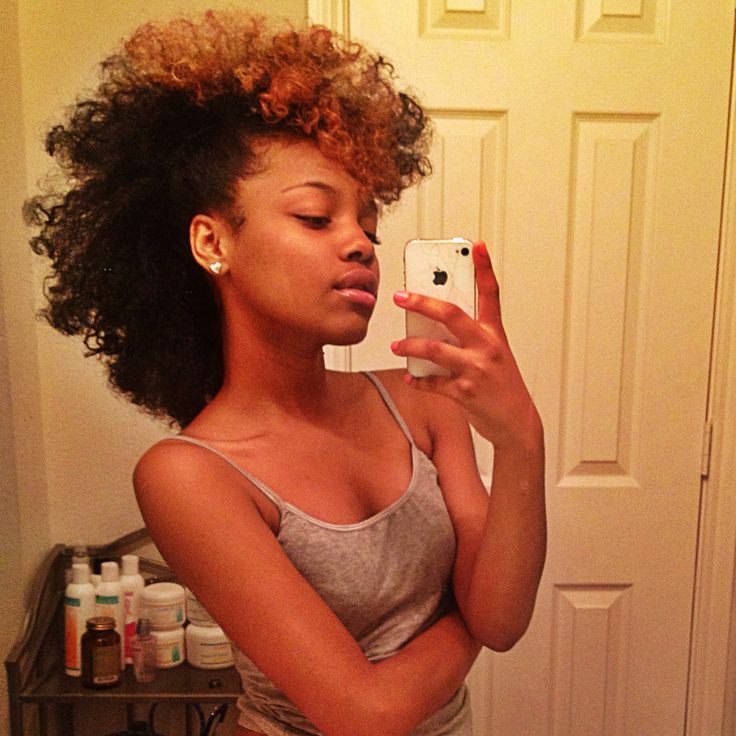 Natural Mohawk styles don’t need to conform to natural hair colors. Instead, be a rebel with a fun bright fuschia or other flower inspired colors that will really accentuate your frohawk and help you stand out from the crowd. If you love your dark hair but want to try something different, use a temporary hair color up top while allowing your dark roots to still shine through beneath. For black women, any non-natural hair color is incredibly stunning, as dark tresses take on bold colors beautifully. When it comes to fun natural Mohawk hairstyles, this one is reminiscent of a joyful clown at the circus. Disregarding any concerns of frizz or uneven color, it all works together for a carefree, whimsical look that’s all your own. Beyond the dramatic look of this style that features half blonde, half black hair, this is also a worthy example of the many braided Mohawk styles out there. Braids can be done at the salon and last for weeks, or you can try them out yourself until you achieve the exact look you love. Combine an afro with tight cornrows for a beautiful style featuring Mohawk braids that get people talking. A Mohawk with natural hair can be a bit tricky to control, so, braiding the side sections will not only create a stunning statement, but keep things more manageable at the same time. Keep your Mohawk on natural hair looking genuinely natural with a free and flirty feel that will quickly win hearts. Pair it with some oversized accessories and enjoy a style that’s not only beautiful, but super simple to maintain, too. Mohawk styles for natural hair certainly aren’t solely about the cut or shape – you can have a lot of fun with vibrant colors, too. Purple is the hue of power and royalty, and so why not to declare to the world how fun and fearless you are? Dye hair a bright lavender all over, or just in a selected section. When it comes to Mohawk styles, this one is bold without being distracting. If you prefer to wear natural hair short, then get your hair cut close to the scalp, but leave slightly longer curls up top. Your naturally tight coils will raise up for a mini mohawk that still allows you the convenience of short hair. Braiding your sides close to the scalp is the easiest way to shape a Mohawk style for natural hair. Usually it suggests multiple thin cornrows, yet you can also cut down their number and make them larger like in the photo. These also feature fun Bantu knots at the ends. More sophisticated versions of Mohawks appropriate for proms and weddings can offer more intricate designs, although the idea is still the same. This hairstyle substitutes spikes for twists which look very neat, elegant and feminine. And 30 other black braided hairstyles are waiting for your attention here. Wow, this is a fantastic way to curb your natural short hair without any need to resort to complex styling techniques. Sleek your sides vertically up and fix the tresses securely with bobby pins. Fluff your “feathers” for the Mohawk crest and enjoy your effortless classy look! If done on longer lengths, the hairstyle from the previous picture will look like in this photo: less resembling classic Mohawk updos, but extremely charming in its own particular way, nonetheless. Besides, the highlighted stripe enhances the resemblance and pushes this gorgeous style closer to the glorious Mohawk family. More gorgeous Mohawks are reviewed here. Oh, this is a work of art, indeed! Not every day you come across so professionally and exquisitely braided hairstyles. Varied distance between these delicate braids and all these numerous curves, bents and twists create an extraordinary protective hairstyle that can be proudly sported not only by little girls, but their mothers as well. And older ladies can check modern hairstyles for women over 50. Mohawk ideas for natural hair are so creative and rich for non-standard solutions, that you can review them non-stop. Anyway, my biggest collection of them is gathered here, and you are, certainly, very welcome to get acquainted with it.